After a pre-safari briefing, depart with afternoon flight to Tsavo West National Park. Upon landing into the park, enjoy a game viewing drive en route to the Lodge to arrive in the early afternoon for check-in followed by lunch. 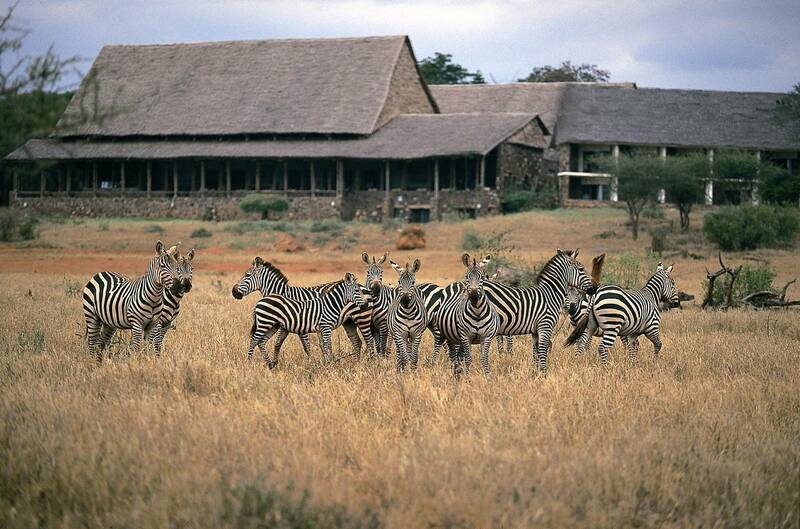 Depart for an afternoon game drive in the park returning to the lodge in time to refresh for dinner. Overnight at Kilaguni Serena Safari Lodge on Full Board basis. Some of the interesting areas to be visited are the Mzima springs, Roaring rocks, Chaimu and Shetani Lava sites to mention a few. Overnight at Kilaguni Serena Safari Lodge on a full board basis. Depart after breakfast in the lodge and drive to Amboseli National park to arrive in the early afternoon for check-in and lunch at Amboseli Serena Safari Lodge. Set against the magnificent backdrop of Africa's highest mountain, the glittering Mount Kilimanjaro, Amboseli Serena Safari Lodge enjoys a uniquely privileged position at the heart of this world-famous national park. Shaded by palm trees, is a free-form swimming pool; to either side of which stretch the rooms. Enjoy an afternoon game viewing drive. Overnight at Amboseli Serena Safari Lodge Camp on a full board basis. After an early breakfast, depart and drive to Nairobi to arrive at the Nairobi Serena Hotel in the early afternoon in time for lunch at Maghreb Restaurant. Justly famed for its exceptional standards of efficiency, service and five-star hospitality, the elegantly sophisticated Nairobi Serena is a member of the Leading Hotels of the World group and is consistently voted ‘Best Hotel” in Nairobi by airlines and international travel magazines alike. Despite its pivotal central location, the Serena remains true to its title and offers an oasis of serenity amidst the bustle of one of Africa's most vibrant capital cities. Overnight at Nairobi Serena Safari Hotel on a full board basis. After breakfast in the Hotel and a pre safari briefing, depart with your Safari Driver Guide and drive via the Great North Road, through the famed Kenyan highlands onto Mount Kenya National park. Drive on to the Serena Mountain Lodge – located at 2,134 meters on the slopes of Mount Kenya. In the afternoon depart for a Guided Forest Walk through the forest, accompanied by the Resident Naturalist. Overnight at Serena Mountain Lodge on a full board basis. Lunch in the Camp followed by an afternoon at leisure to enjoy the facilities at the Camp that include a swimming pool. Afternoon game viewing drive in the Conservancy. Overnight at Sweetwaters Serena Camp on a full board basis. Enjoy an afternoon game viewing drive in the Conservancy. The Conservancy protects over 450 bird species and 15,000 wild animals. Rothschild giraffes have found a safe haven for breeding here, while a diverse variety of terrain shelters many species - from herds of giant elands to tiny dik diks and cliff-dwelling klipspringers. Overnight at Lake Elmenteita Serena Camp on a full board basis. There is a swimming pool and the new terrace gives you an opportunity to enjoy the sweeping views of the of the expansive Maasai Mara plains. Enjoy an evening game drive in the reserve. Certainly the most frequented game reserve in Kenya, Maasai Mara is a magnificent landscape of open plains bisected by the Mara River and its tributaries, and punctuated by marshes and forests. Return to the lodge for dinner and overnight. Overnight at Mara Serena Safari Lodge on a full board basis. Hippo Pool Breakfast. On one of the mornings, crown your game viewing experience with a “Bush Breakfast” by the Mara River Hippo Pools! One cannot resist the charming “Jambo” from the chefs and Masai warriors as they welcome you to our wonderfully set breakfast buffet of cold cuts, fruits, cereals and hot dishes with eggs made to your specifications as you wait. The hippos keep you company and only say “Kwaheri” (good bye) after you have had enough. Overnight at Mara Serena Safari Lodge on a full board basis. On the last night in the Mara, you will be hosted to a “Star Lit” Bush Barbecue Dinner: The Star Lit Bush Dinner. Nothing is quite so essentially ‘Safari’ as the traditional ‘bush dinner’, especially when it is enlivened by the presence by a group of scarlet-clad Maasai Morans (warriors). Your Star-lit dinner begins with cocktails around the campfire. Dinner will then be cooked on a blazing BBQ, accompanied by a wide range of salads and vegetables. While dessert and coffee is served, the Maasai Traditional Dancers will entertain you with songs, chants and dance displays. After dinner, you will be driven back to the lodge. Overnight at Mara Serena Safari Lodge on a full board basis. After breakfast, Check-out and transfer to Mara Serena Airstrip for your scheduled flight to Nairobi Wilson Airport. Met on arrival by our representative and transfer to Nairobi Serena Hotel for a lunch in Café Maghreb Restaurant. Later transfer to Jomo Kenyatta International Airport for your home flight to Mombasa. On arrival at Moi International Airport you will be met by our representative and transfer to Serena Beach Resort & Spa where you have been booked on a half board basis (Bed, Breakfast and Dinner) for the next three nights. Overnight at Serena Beach Resort and Spa on a full board basis. Two full days in Mombasa at leisure to enjoy the beach and resort’s facilities. At its heart lies the coral-built ‘Fortress of Tranquility' of the exquisite ‘Maisha' Mind, Body and Spirit Spa. On the last evening, you will be hosted to a farewell dinner at our renowned Seafood Restaurant, Jahazi Grill - An Arabian Dhow-themed restaurant. Alluring ocean views and the gentle sounds of the surf complement the seafood menu that makes Jahazi Grill the best Mombasa! Enjoy an array of dishes that use only the finest and freshest local ingredients, including fresh fish caught daily. Overnight at Serena Beach Resort and Spa on a full board basis. Breakfast in the resort. Later transfer to Moi International Airport for your scheduled flight to Jomo Kenyatta International Airport, Nairobi for onward connection to your home bound international flight. • Excursion to Lake Nakuru National Park and Kariandusi pre-historical site. • All items of personal use i.e. drinks, laundry, telephone calls, gratuities, personal travel insurances etc.